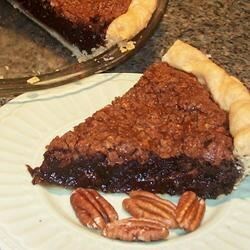 "A southern recipe for a rich chocolate pie with pecans. Passed down from my Mother and Grandmother." Mix together sugar, cocoa, and melted butter. Stir in evaporated milk, beaten eggs, vanilla, and chopped pecans. Pour nut mixture into unbaked pie shell. Bake for 10 minutes. Reduce heat to 325 degrees F (165 degrees C) and bake for 30 minutes. This turned out perfectly for me! Thanks for the great recipe.